Cooking for Chanukah or any of the holidays has a special meaning to me. When I am cooking, I always want to be the best that I can be and produce the best looking and tasting meals. To me as a chef, there is no greater compliment than having my holiday food compared to one’s grandmother’s or mother’s and, on these special days, to help others enjoy and reminisce. So when I arrive at the kitchen on a holiday I am always thinking about how I can make this day even more special for our guests. In the years to come, hopefully, our members will add their holiday experiences at The Legacy to their fond memories. It is traditional to eat fried food during Chanukah because the cooking oil symbolizes the oil that burned for eight days instead of one in the Temple, so I always like to add latkes to my Chanukah menu. Combine all ingredients and set aside. Heat oil in frying pan to 350°. Drop one large tablespoon at a time into frying oil until golden brown. Flip and fry until golden brown on the other side. Remove from oil and drain. Makes 120 pancakes. Tip from Chef Ralph: Adding fresh Italian parsley boosts flavor and acts as an all-natural sweetener. Mix cold butter, cream cheese, sour cream, flour and salt together until the mixture becomes crumbly. Form dough into four equal balls and refrigerate for at least two hours. When the dough is chilled, roll each ball into a flat circle about 9 or 10 inches across. Spread equal amounts of sugar, cinnamon, nuts and raisins over each round. Cut into 12 equal triangles like a pizza. Roll each triangle from the wide edge to the point to form a crescent. After all the cookies are formed, chill dough for an additional 30 minutes and preheat the oven to 350°. Place the dough onto a greased cookie sheet and bake 20 to 25 minutes or until golden brown. Makes 48 cookies. Tip from Chef Ralph: You can also fill the dough with your favorite preserves. Combine all ingredients (except flour) and mix well. Add in flour and continue to mix until smooth. Heat oil in frying pan to 375°. Drop one large tablespoon at a time into frying oil until golden brown. Flip and fry until golden brown on the other side. Enjoy right out of the pan or set aside and reheat. Serve as is or with sour cream. Makes 32 pancakes. Ralph Edmonds, executive chef of The Legacy at Willow Bend, has over 17 years of culinary experience in some of the finest kitchens across the nation. Prior to joining The Legacy at Willow Bend, Chef Ralph served as executive chef for the Denton Country Club in Denton and the Columbian Country Club in Carrollton. In addition, his experience includes upscale hotels, resorts and clubs, including the Pierre Hotel, Sheraton St. Regis and Sheraton Park Avenue in NYC; The Harvard Club in NYC; and Gaylord Texas Resort in Grapevine. “Since you prepare eight different charosets at Passover, I figured you’d make lots of exotic latkes too,” he said. While Robbie meant this as a compliment, he caught me off guard. Since he knows I enjoy cooking and inventing recipes, he set the bar high. Yet his question got me thinking. Why are latkes usually made from potatoes? Why are they almost exclusively served at Chanukah parties or for dinner? What’s wrong with other times of day? Everyone loves latkes, so I thought it would be fun to create a new latke recipe for each day of Chanukah. For years I’ve had a secret desire to eat latkes all day, starting at breakfast. I wondered why no one had ever created cocktail-hour latkes. I’ve had dessert latkes, but none worth eating again. One cold October weekend, I decided to revamp Chanukah’s signature dish, experimenting with ingredients as far-flung as bananas, salmon and chocolate. Yet with a twinge of Jewish guilt, I questioned if it was right to take latkes so far from their roots, the lowly potato. In Yiddish, the word latke means pancake. The definition doesn’t include a connection to potatoes. After consulting Webster’s Dictionary, I confirmed that a pancake is a thin, flat cake of batter fried on both sides on a griddle or in a frying pan. Although Ashkenazi Jews are famous for preparing latke batters with grated potatoes, the tuber is a relatively recent addition to their culinary repertoire. Originating in South America, potatoes were unknown in Europe until the 16th century, when explorers brought back tuber shoots from their travels. Once planted, these shoots grew abundantly throughoutEastern and Central Europe, where produce was sparse during harsh winters. Potatoes became an inexpensive crop to farm and arose as a staple of the Ashkenazi diet. It didn’t take long for Jewish housewives to discover the wonders of grated potato batter sizzling in chicken schmaltz. At Chanukah, the shortening of choice was goose fat. The crunchy result is now history. Although potatoes have proven to be a superior latke ingredient, I decided to see if other foods could enhance the Jewish pancake genre. Since breakfast is my favorite meal, I began by dropping a dollop of yogurt into my basic flapjack recipe, creating a tender pancake as airy as a cloud. From that recipe I played around with ingredients, giving rise to three more early morning delights: fragrant Banana Latkes, dripping with maple syrup; Creamy Lemon Latkes, dusted with confectioners’ sugar; and assertive Tex-Mex Latkes, spiced with chili and cumin. My original pancake recipe was so delicate, I turned my attention to dessert. Two sensational confections evolved: Pumpkin Latkes, flavored with cinnamon, nutmeg and cardamom; and Chocolate Chip Latkes, smothered in chocolate sauce and vanilla ice cream. Satisfied with my results so far, I had to admit I missed the texture of potato latkes. Noticing a package of fine egg noodles in my pantry, I remembered the zucchini in my refrigerator. Together these two ingredients fried up every bit as crisp as their traditional counterpart. My husband thought I was crazy as he observed me fry everything that was inside our refrigerator — except the bins and the shelves. But after weeding out a few wacky flavor combinations, he reaped the benefits of tasting some amazing latkes. Asian fusion ginger latkes dipped in soy sauce were a notable failure. “A few days into Chanukah, potato latkes can grow tiresome,” I said. “I haven’t tried the Tex-Mex latkes yet,” he said. 1. In a small pot, melt 3 Tbsp. butter. Cool briefly. 2. In a large bowl, beat egg, yogurt, milk and melted butter, until foamy. 3. Sift flour, baking powder, and salt into egg mixture. 4. With a wooden spoon, stir ingredients until well combined. 5. Melt 2 Tbsp. butter in a large (12-inch-diameter) skillet, preferably the no-stick variety, until butter sizzles but doesn’t burn. 6. Pour half a soup ladle of batter at a time into hot pan. When bubbles appear in batter and bottom surface turns golden brown, flip pancakes. Turn only once. Gradually add more milk to batter if it thickens while first batch cooks. Add more butter to pan, if needed. 7. Serve pancakes immediately. If making several batches, pile pancakes onto an ovenproof dish and keep warm in a 200° oven until ready to serve. Mash 1 banana (preferably overripe) with a fork until mushy. Add banana to step 3 of Basic Flour Latkes recipe and follow remaining directions. Serve with maple syrup and chopped walnuts. To step 3 of Basic Flour Latkes recipe, add 1/2 c. whipped cottage cheese, 1/2 tsp. vanilla, 1/2 tsp. lemon zest and 1 tsp. sugar. Follow remaining directions. Sprinkle confectioners’ sugar over top of latkes and serve with black cherry preserves. To step 3 of Basic Flour Latkes recipe, add 1/2 c. canned cream-style corn, 2 minced garlic cloves, 1 Tbsp. minced roasted red pepper (from jar), 1/2 tsp. ground cumin and 1/2 tsp. chili powder. Fry latkes in peanut oil and follow remaining directions. Sprinkle freshly minced cilantro on latkes. Serve with sour cream. In a large bowl, mix together with a wooden spoon the salmon, onion, dill, flour, egg, salt and pepper until well combined. Form salmon mixture into latkes, 3 inches in diameter. Heat oil in a large skillet on a medium flame. Fry latkes in oil until bottom surface browns, then turn latkes and brown the other side. Fry for about 6 minutes per side, or until latkes are cooked through. Serve immediately with sour cream. Prepare noodles according to package directions. Drain and place in a large bowl. Mix in 1 Tbsp. peanut oil. Cool briefly. Mix in remaining ingredients. Form batter into 3-inch latkes. Heat 3 Tbsp. oil in a large skillet. 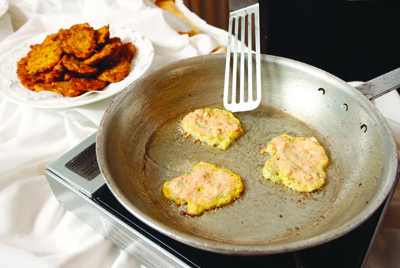 Fry latkes in skillet. Turn over when bottom surface is well browned. Continue frying until top is well browned too. Drain on paper towels and serve immediately. To step 3 of Basic Flour Latkes recipe, add 1/2 c. canned pumpkin, 1 Tbsp. brown sugar, 1/2 tsp. cinnamon, 1/4 tsp. nutmeg, 1/4 tsp. ground cloves and 1/4 tsp. cardamom. Follow remaining directions. Serve with butter pecan ice cream. To step 3 of Basic Flour Latkes recipe, add 1/2 c. chopped semisweet morsels and 1 Tbsp. granulated sugar. Follow remaining directions, but fry on a medium-low flame so chocolate doesn’t burn. Serve with warm chocolate sauce (or melted semisweet morsels) and vanilla ice cream.